Unique modern stylish deskside design. Optional paper recycling bag. 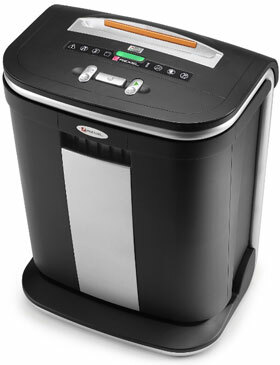 Shreds up to 16 sheets in a single pass. 27 litre bin capacity. Auto cut out when bin open. LED cool down indicator. Carry Handles. *THE EXTENDED WARRANTY DOES NOT INCLUDE NORMAL WEAR AND TEAR OR EXCESSIVE CD SHREDDING. IT COVERS THAT THE CUTTERS WILL BE FREE FROM manufacturing defects.